Every day, Watch This offers staff recommendations inspired by the week’s new releases or premieres. This week: America celebrates its independence (and court victories), so let’s celebrate some excellent patriotic movies—or at least the ones that make us feel proud of our country. Dog Day Afternoon opens on a series of images that set the tone for the entire film. A boat sails into harbor. Dogs root in the trash on the street. Store owners sweep the pavement in front of their turf. Young people horse around. We’re seeing everyday working-class Joes doing definitively everyday, working-class things. These scenes abound in dirt and grit, lovingly and critically rendered by cinematographer Victor J. Kemper, who captures the joy as well as the decay of a crowded city. This sensibility of skeptical reverence belongs distinctively to director Sidney Lumet, who spent much of his career producing scalding crime films that reveled in the perils of maintaining even a quasi-socially functional melting-pot America, while asserting it nevertheless to be a land that’s worth fighting to preserve and improve. Relating the true story of a disenfranchised Vietnam War veteran, here called Sonny (Al Pacino), who disastrously tries to rob a bank in Brooklyn only to incite a prolonged hostage situation, Lumet focuses relentlessly on the social hypocrisies and constrictions that bind American citizens as much now as they did during the film’s release in 1975. The eagerness of the police to brutalize Sonny is lingered upon, the images of their drawn guns particularly haunting in the wake of contemporary controversies. Sonny, though unhinged, is understood to be expressing feelings of futility that connect him with the struggling employees of the bank that he tries to rob. Sonny’s bond with his hostages isn’t sentimental, because Lumet and Pacino diagnose it as a case of enemies sharing a larger common enemy, which, in this case, is a social pecking order that incites a variety of tensions relating to race, gender, class, etc. The film’s often a tough pill to swallow, admittedly failing to adhere to any conventional idea of a sweepingly patriotic movie, which is precisely what’s so affirming and, yes, patriotic about it. Real patriotism isn’t self-congratulatory. Instead, it seeks improvement via tough idealism. Dog Day Afternoon is bleak and severely critical of an America that was reeling in the wake of a devastatingly unpopular war and several assassinations, not to mention New York’s escalating poverty level, which spurred class warfare that was pronounced and unstable even by the standards of this country. But Lumet looks these issues straight in the face, never losing his cool or indulging in nihilism. 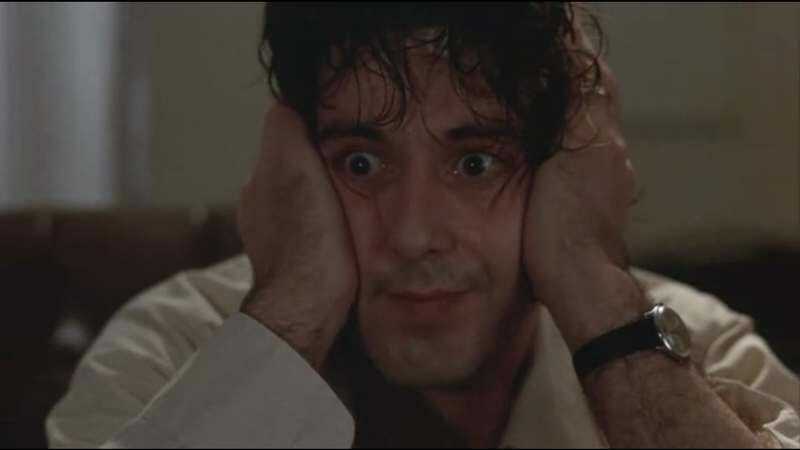 Dog Day Afternoon is a frank social melodrama that’s also a celebration of quotidian bravery. The camera might linger on guns and barely restrained violence, but it also dwells upon the love and the support that’s extended in the weirdest and most unexpected of places. When the bank manager, Mulvaney (Sully Boyar), is given the unexpected opportunity to exit the hostage situation, he stays, for reasons that probably surprise and baffle even him. Moments before the hostages are all freed, one of them wishes Sonny’s partner Sal (John Cazale) luck flying away on his theoretical getaway. Despite Sal’s status as imprisoner, the woman sees the vulnerability and the terror that lurk underneath his impression of viciousness. The most pronounced and obvious display of this film’s empathy can be found, of course, in Sonny’s heartbreaking phone conversation with his transgender wife, Leon (Chris Sarandon), which is staged with a matter-of-fact sense of decency and sobriety that remains noteworthy. This film understands American democracy for what it is: not only a right, but a challenge. Availability: Dog Day Afternoon is available on Blu-ray and DVD through Netflix or possibly your local video store/library. It can also be rented or purchased through the major digital services.